Manufacturer of a wide range of products which include concrete floor saw cutting machine and groove cutting machine. 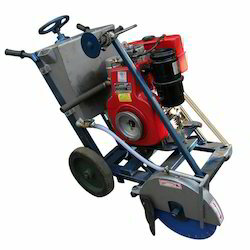 We offer Concrete Floor Saw Cutting Machine to our clients. The widest selection of diesel and electric floor saw models anywhere in the world. Floor saws used for wide applications, extensions, renovation and demolition of streets, buildings runways of airport, bridges, machine foundations and walls. Looking for Groove Cutting Machine ?